History won't be made this Friday (March 29). NASA astronaut Anne McClain assists fellow NASA astronauts Christina Koch and Nick Hague during a spacesuit fit check on March 18, 2019. The first all-female spacewalk in history won't be happening this week after all due to a last-minute crew swap, NASA announced today (March 25). NASA had planned to send astronauts Anne McClain and Christina Koch on what would have been the first-ever all-female spacewalk this Friday (March 29), but International Space Station mission managers have "decided to adjust the assignments, due in part to spacesuit availability on the station," agency officials said in a statement. While Koch is still on the schedule to take her first spacewalk on Friday, McClain will stay inside the orbiting lab this time. 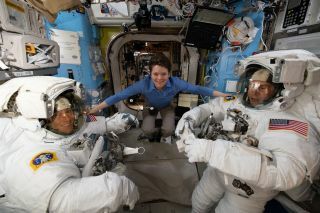 NASA astronaut Nick Hague will take her place. Friday's spacewalk will be the second in a series of three that NASA has planned so far for Expedition 59. Last Friday (March 22), McClain and Hague spent nearly 7 hours working outside the orbiting lab to replace aging batteries on the station's solar arrays. The second spacewalk will be almost identical to last week's spacewalk, only the astronauts will be replacing a separate batch of batteries. McClain, who demonstrated her battery-swapping skills during last week's spacewalk, will have to sit out this week due to a spacesuit sizing issue. "McClain learned during her first spacewalk that a medium-size hard upper torso — essentially the shirt of the spacesuit — fits her best," NASA officials said. "Because only one medium-size torso can be made ready by Friday, March 29, Koch will wear it." Space station astronauts conduct multiple spacesuit fit checks when preparing for spacewalks, because the human body grows taller in microgravity. Earlier this month, McClain tweeted that she had already grown 2 inches (5 centimeters) since she launched to the station in December. It's not immediately clear why the spacesuit sizing has only now become an issue — Space.com has reached out to NASA for more details, and we'll post an update once we learn more.